Aria 3494, a member of Decision Data's family of cluster controllers, emulates a 5494 Remote Control Unit. Designed with flexibility in mind, it provides a number of connectivity options. Small footprint. Aria's 1.75" profile is the slimmest on the market today. Your choice: 19 rack mountable or small footprint tabletop cabinet. Fast, easy communication options. SDLC, ethernet, token ring, X.25, frame relay to AS/400. Easy configuration. Configure locally from a twinax display or remotely via FTP. Easy access. Up to 80 LAN users (PCs) can access from one to eight AS/400s using Aria 3494s ethernet, token ring or frame relay connection. Easy to upgrade to meet changing needs. All upgrades achieved externally without special tools no need to remove the covers! Standard 28 twinax device support. The Aria 3494 controller provides complete 5494 control unit emulation in the slimmest contemporary design available today. At just 1.75 inches tall, it fits on any desktop or can be rack-mounted in a standard 19 rack. With its small footprint, it can also be tucked inside a cabinet, giving the user two choices for mounting the unit. Aria 3494s connectivity is complemented by full LAN and WAN support. Support for token ring downstream physical unit ((DSPU) attachment enhances host access for a total of up to 56 twinax users. Token ring gateway capabilities provide access to AS/400 host applications for up to 56 twinax-attached terminals and up to 80 token ring devices. Ethernet gateway capabilities provide access to AS/400 host applications for up to 56 twinax-attached terminals and up to 80 ethernet devices. 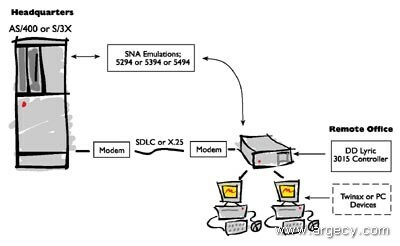 For WAN connectivity, Aria 3494 provides access to SDLC, X.25 and frame relay networks across a single communication port. Configuration is a breeze from any attached twinax display. As an option, the built-in management agent provides the controller with additional useful features such as SNMP management and setup file downloading (via FTP protocol). Aria 3494 can be upgraded externally in the field to meet your changing needs. You can easily expand from 28 to 56 twinax devices. You can add ethernet or token ring at any time, without removing the controllers covers. Aria 3494 also gives you a frame relay option, making it one of the easiest controllers on the market to upgrade. Host Support: Provides access to up to eight (8) AS/400 hosts simultaneously. Supports multiple physical units on a line. PU Type 2.1 with LU 6.2 Low-Entry Networking (LEN) end-node support. Ethernet Device Support:10 Mbps with Type 1 and Type 2 LLC support, direct ethernet attachment (DSPU) for up to 56 twinax devices; in gateway mode connections up to 80 ethernet programmable workstations; direct ethernet attachment and gateway mode are available concurrently. Token Ring Device Support: Optional 4/16 Mbps, IBM token ring (IEEE 802.5) with Type 1 and Type 2 LLC support; direct token ring attachment (DSPU) for up to 28 to 56 twinax devices; in gateway mode connections up to 80 token ring programmable workstations. Twinax Devices: Decision Data or other 5250 compatible workstations. Standard configuration supports 28 twinax devices. Easily upgradable to 56 twinax devices. Host LAN Connection: Host connected to LAN in DSPU mode: token ring or ethernet. Host WAN Connection: Frame Relay, SDLC or X.25 protocols using a V.24/V.35/X.21 internal interface. V.24 interface can be used for speeds up to 56 Kbps. Optional V.35 or X.21 interfaces for speeds up to 64/128 Kbps. Remote Setup File Download: Built-in TFTP server for controller setup file LED Control Panel: LED control panel for status and diagnostics. Host Software: Supports AS/400 software including IBM PC Support/400, Client Access/400, and OfficeVision/400. Operating Features: Auto configuration, 132-column display, copy to print, IPDS, type-ahead, data collection devices, 5250 enhanced Graphical User Interface (GUI), and pointing device support. Service and Warranty: Diagnostics available from the front panel, and error logs, simplify problem determination. Multiple LED displays keep you informed on system status during start-up and normal operations. Error conditions displayed are logged for reference. Connectivity to the management module expands diagnostic options. 1.72 in. x 17.8/19 in. x 13.2 in.